The second edition of the College All-Star Game, played on August 29, 1935 for the benefit of Chicago charities, was the first (and only) in the series in which the team representing the professionals was not the defending NFL (or, later, Super Bowl) champion. The Chicago Bears, back for a second straight year after playing to a scoreless tie in the inaugural event, had gone undefeated in topping the Western Division in 1934 but lost the title game to the Giants. The Bears, coached by George Halas, were hindered by injuries to FB Bronko Nagurski and HB Gene Ronzani , both of whom played only briefly, and were also without their regular quarterbacks, Carl Brumbaugh and Keith Molesworth. The All-Stars, who were picked by the votes of over 737,000 fans, were coached by Alabama’s Frank Thomas and contained future Hall of Fame end Don Hutson out of Alabama, future Green Bay coach Phil Bengtson, a tackle from Minnesota, and future President of the United States Gerald Ford, a center who starred at Michigan. There was a big crowd of 77,450 in attendance at Soldier Field for the Thursday night game with heavy rain falling throughout much of the contest. The Bears got on the board in the first quarter of what quickly turned into a defensive struggle. 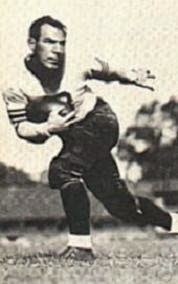 Carries of 18 and 12 yards by HB Beattie Feathers (pictured above) put the ball on the All-Star three yard line, but Chicago was unable to cross the goal line in the next three plays and settled for a 27-yard field goal by Jack Manders. That was it until the final period. The collegians got a break at one point when Chicago drew a 15-yard penalty after reaching the All-Star two and came up empty, but by and large the teams punted often while maneuvering for field position. In the fourth quarter, HB Bill Shepherd of Western Maryland, attempting to punt from his own end zone, dropped the ball as he fielded a bad snap and was smothered for a safety by the Bears. Still, the All-Stars nearly managed to pull the game out. They got their best field position of the game at the Chicago 42 thanks to a short punt. Following a one-yard run, Shepherd took off around end for 14 yards and then Don Hutson ran the ball on a reverse and reached the eight yard line. However, at that point the Bears held on defense and the All-Stars were forced to give up the ball on downs. Chicago came away the winner by a final score of 5-0. The Bears had the advantage in total yards (166 to 127) and first downs (10 to 6). Each team punted 14 times and both had just two pass completions apiece due to the weather conditions, on nine attempts by the All-Stars and 11 by Chicago. The Bears were hurt by 112 yards in penalties. Bill Shepherd and tackle Tony Blazine of Illinois Wesleyan had the most noteworthy performances for the All-Stars. Beattie Feathers, who had been a participant the previous year as a member of the All-Stars, played well for the Bears, with some effective line-drive punts as well as his running. The Bears went 6-4-2 during the regular season, which, with all of the Western Division teams finishing with winning records, placed them third behind the Lions and Packers. They would go on to play in a total of seven College All-Star Games, compiling a record of 5-1-1. Bill Shepherd started off the 1935 season with the Boston Redskins, but was traded to Detroit and was a component of the Lions’ outstanding ground attack on the way to winning the NFL Championship. He received second-team All-NFL honors from UPI and the Green Bay Press-Gazette. Shepherd stayed with the Lions for five more years and continued to be a key player in the backfield.